Associated Press Indie bookseller Newtonville Books in Newton, Mass., has a counter of backward books. Owner Mary Cotton says the books are glued together. Looking for an easy way to organize a messy bookshelf? You might consider turning all the spines backward. Yes, the backward bookshelf is one of the easiest ways – albeit, not too functional – to clean up a hodgepodge of texts. It's also an interior design craze that's about as culturally divisive as national politics in America. Advocates tout the simplistic texture of the pages, while opponents argue that the idea is just plain stupid since you can't see which books are which. Generally speaking, you love it or hate it. The backward bookshelf began to trend in the mid-aughts, mostly as an artistic styling tool in photographs on small-scale design blogs or bookshop websites. Now, big-box retailers West Elm and the Container Store have incorporated backward bookshelves into their product displays. A Google search for “backward books” will bring back millions of results, from sites including social-media mainstays like Pinterest and Instagram, various women's magazines and some interior design staples like Apartment Therapy. Backward books, Cole said, do align with the neutral, monochromatic look that is popular now in design. Achieving a simple, stylish look is exactly why Cari Shane turned her books backward. Four years ago, the public relations executive was renovating a 1914 row house in Washington, D.C., when her teenage daughter suggested the idea. The books used in the display were ones Shane had no plans to reread. “I couldn't tell you what books they are,” she said. On the other hand, Nathan Shafer, a lifelong reader and book collector, has filled his Arvada, Colorado, home with hundreds of books, none of which face backward. “They're entities, and when you turn them all backward it renders them one anonymous mass,” Shafer said. And an anonymous mass, Shafer said, defies the purpose of books. 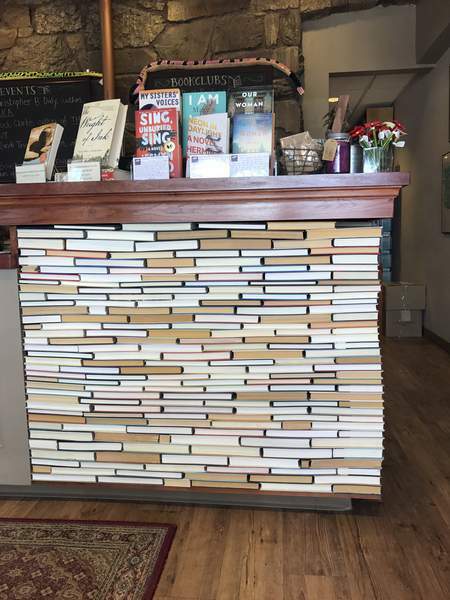 There are occasions, however, when art is executed just right, at least according to the customers of Newtonville Books, an independent bookseller in Newton, Massachusetts. The store's counter is filled with backward books in different sizes and colors. The shop's owner, Mary Cotton, saw the styling tool on the website of an Australian bookstore six years ago. “We wanted to do something that was really beautiful and interesting, some sort of book art project,” she said. An architect helped design and execute the plan. Customers ask what books were used to make the counter, but Cotton said they never wrote down the titles. And, since the books are glued into place, there's no way of moving them.